Julian Taliaferro is a former Charlottesville City Councilor and former city fire chief. Taliaferro has been a resident of Charlottesville since 1962, when he began his career with the Charlottesville Fire Department. His fire service career was interrupted in 1966 when he entered the U.S. Army and was sent to Vietnam. He received the Purple Heart and Bronze Star medals for action in the Tet Offensive during 1968. Taliaferro served as Fire Chief for almost 34 years. He played a major role is getting the fire department internationally accredited with the Center for Public Safety Excellence in 2001 as one of 121 departments in the world to achieve this designation. Taliaferro retired in 2005, but still holds the position of Fire Chief Emeritus. Taliaferro is married to Patricia Taliaferro and has two grown children. 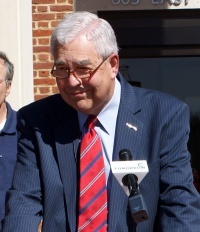 Julian Taliaferro is a former member of Charlottesville City Council and a former Vice Mayor who served from 2006 to 2009. Taliaferro is also a former chief of the Charlottesville Fire Department. He voted against the Piedmont Family YMCA being built on a site in McIntire Park. Taliaferro was one of three candidates who sought nomination to one of two slots on the Democratic Party's ticket. He announced his nomination for a second term on March 9, 2009. After a brief campaign, the Democrats opted that year to hold an "unassembled caucus" on May 9, 2009 to determine a nominee. Taliaferro came in third in the balloting behind incumbent City Councilor Dave Norris and challenger Kristin Szakos. Graduate of the Executive Fire Officer Program, National Fire Academy. ↑ 2006 Voters' Guide, Charlottesville Tomorrow. ↑ Web. Julian Taliaferro Announces for City Council, Brian Wheeler, Charlottesville Tomorrow, January 30, 2006, retrieved May 21, 2015. ↑ Julian Taliaferro announces campaign for re-election to City Council Nairn, Daniel, and Brian A. Wheeler, Charlottesville Tomorrow News Center. Charlottesville Tomorrow, 9 Mar. 2009. Web. 10 Aug. 2009. ↑ "Charlottesville Democrats nominate Norris and Szakos for City Council" Charlottesville Tomorrow News Center. Charlottesville Tomorrow, 9 May 2009. Web. 10 Aug. 2009. This page was last edited on 22 February 2016, at 13:36.